Background : Son of Philip Blencowe Kingsbury and Florence Annie Kingsbury, of Northcote, Victoria. Enlisted 16/05/1940. Posted to 2/2 Pioneer Battalion 31/05/1940. Transferred to 2/14 Infantry Battalion 07/06/1940. Embarked Aquitania 19/10/1940. Disembarked Middle East 29/01/1942. Embarked Adelaide 29/01/1942. Disembarked Adelaide 24/03/1942. Embarked Brisbane 06/08/1942. Disembarked Port Moresby 12/08/1942. Killed in action 29/08/1942. Awarded Victoria Cross 11/03/1943. Buried Kokoda War Cemetery 25/01/1943. Re-buried Soputa War Cemetery 20/01/1946. Re-buried Bomana War Cemetery 24/11/1946. Soldier's club at Watsonia, Victoria named after him in 1959. 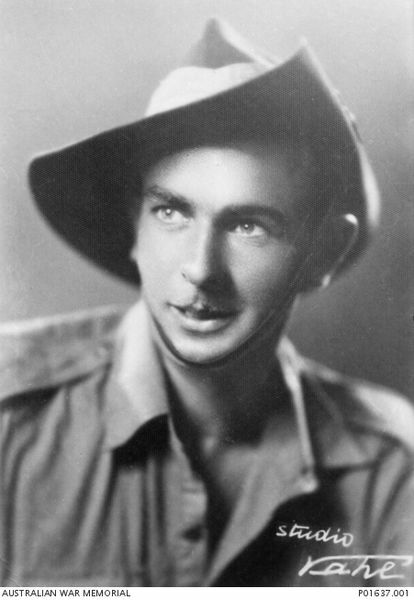 The following details are given in the London Gazette of February 5th, 1943 (for his Victoria Cross); In the Isurava area, New Guinea, in August 1942 the battalion (2/14 Infantry Battalion) to which Pte. Kingsbury belonged had been holding a position for two days against continuous and fierce attacks. On August 29th the enemy broke through on the right flank, creating a serious threat to the battalion and its headquarters. It was essential to regain the lost ground immediately, and Pte. Kingsbury, one of the few survivors of his platoon, volunteered to join another platoon ordered to counter-attack. Rushing through terrific machine-gun fire, and firing his bren gun from the hip, he succeeded in clearing a path through the enemy, inflicting an extremely high number of casualties; but was seen to fall, shot dead by a sniper. Pte. Kingsbury displayed a complete disregard for his own safety. His initiative and superb courage made possible the re-capture of the position, which undoubtedly saved battalion headquarters as well as causing heavy casualties among the enemy. His coolness, determination and devotion to duty in the face of great odds were an inspiration to his comrades.